*This is from my column in StarMetro. There’s more to come, and this is just the first part with plenty of pictures. Enjoy! *EDITED (7 Oct 09) – I know some of you are puzzled/surprised as to how I ate everything below. 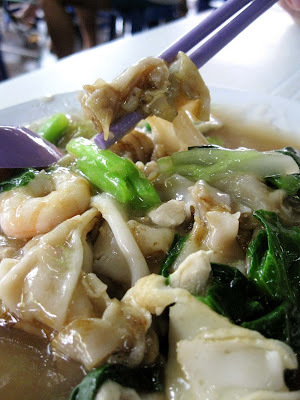 I didn’t do it all in one day; I spaced the eating out throughout the 4 days I was in Penang. And I shared the food with others. WARNING: Before I begin, those on a diet or aged 55 years and above should refrain from reading this, as plenty of duck eggs, lard oil, fried lard, oysters, seafood and sugar are involved. I was in Penang recently, for four days of non-stop eating. 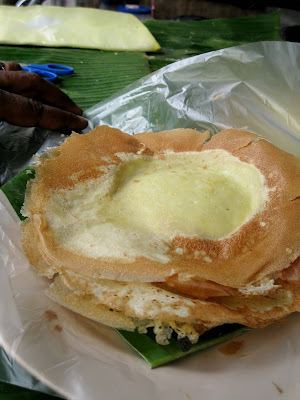 I usually go up north twice a year to indulge in all the good food Penang has to offer; both island and mainland. It was a great trip, and I got to try many new food places recommended by friends and some readers. 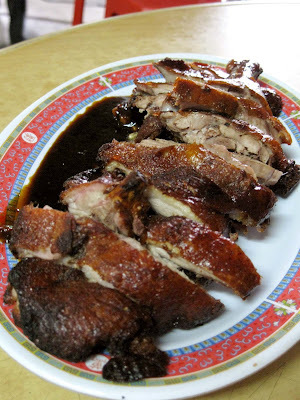 Restoran Hun Tai is known for its pei pa duck (RM28-whole, RM14-half) and pan mee (RM3). 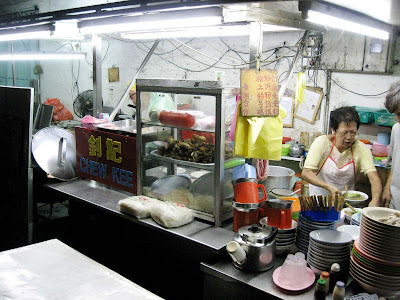 It is a family business, where the wife mans the pan mee stall and the husband is in charge of the drinks and duck. 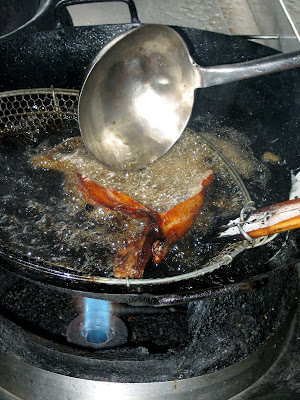 Here, the roast duck is repeatedly bathed with hot oil in the wok, which makes the skin crispy. I liked eating the crispy sides, especially the bishop nose as it retained a bit of fat beneath the skin. The meat was tender and best eaten with the sweet sauce served at the side. 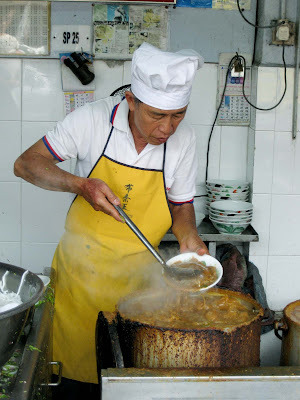 The pan mee is made to order, using a noodle maker. 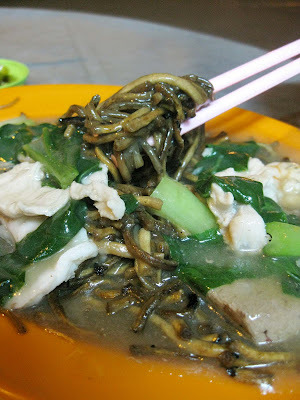 Our kon loh (dried) version contained vegetables, seaweed, ikan bilis and fried fish cake. I liked the texture of the noodles; they were cooked just right and had a good bite. 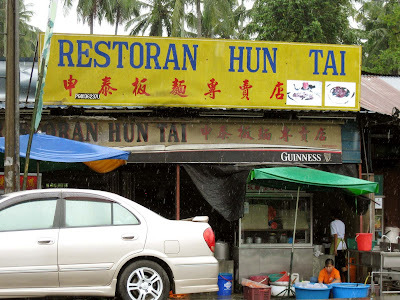 Restoran Hun Tai 8A Stall, Jalan Padang Serai, 09600 Lunas 019 412 9652 (Mr Seng). 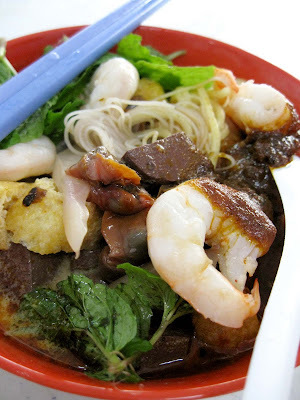 One of my regular readers told me about the Char hor fun at Chulia Street. Based on her directions, we found ourselves in front of a stall called Chiew Kee. The auntie was quite cranky, and since I speak very little Chinese, I had a hard time ordering a plate of Char Hor Fun (RM5) and Hokkien Char (RM5). The noodles were very good. Both were full of wok hei (smoky flavour) and the gravy was thick and flavourful from the prawns, pork, fish cake, vegetables and liver. It was as though the noodles were dancing in wok fire. Good stuff! However, it was rather expensive for such a small portion. I finished my noodles in just 4-5 bites. Nasi Kandar Line Clear is situated in a small, narrow lane off Penang Road, and serves a really mean version of nasi kandar. 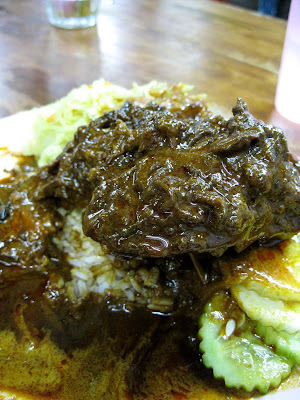 I always pile my nasi kandar with honey chicken, telur dadar, vegetables and “kuah banjir” (RM6.50). The mix of different curries makes the whole experience satisfying. This time, I shared a plate with friends, as I was very full from everything I ate before. The curries here have a good balance of spices, so it complements the rice and dishes. Have your rice with a cup of frothy teh tarik, and you’re sure to leave the place satisfied! Note: Look out for their yellow and green signboard – there are a few nasi kandar restaurants along the main road. The other nasi kandar restaurants will place their staff outside to ‘invite’ you into their restaurant. 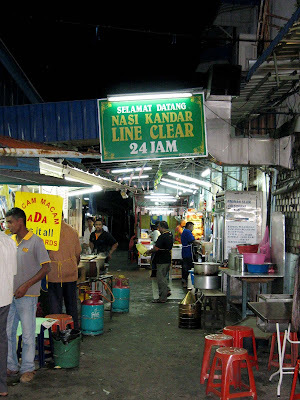 Line Clear Nasi Kandar Jalan Penang (small lane). Open 24 hours. Not satisfied with the Balik Pulau Asam Laksa, we went to Air Hitam for another bowl of laksa (RM2.70), shared between the two of us. Here, the Asam Laksa soup was thick, with plenty of fish and a good proportion of tamarind stock and sweet shrimp paste. It was piquant from the asam, lemongrass, galangal and chilli. 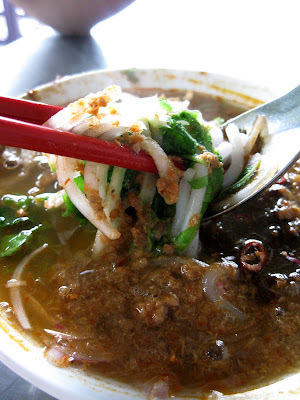 I still think this is the best tasting Asam Laksa in Penang. We also like eating the fried popiah (RM1 each) from the stall next door. 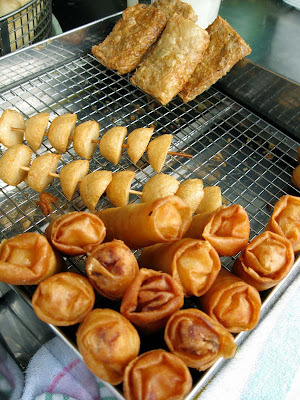 Each roll was tightly packed with sengkuang filling, and deep fried till golden brown and crispy. Walk up the road, and you will find a lady selling pandan mua chi. I thought it was different from the usual varieties, as the mua chi had a green tinge from the fresh pandan juice added in the cooking process. Air Itam Market Pasar Road (Beside the Air Itam Market) 11500 Air Itam Penang. 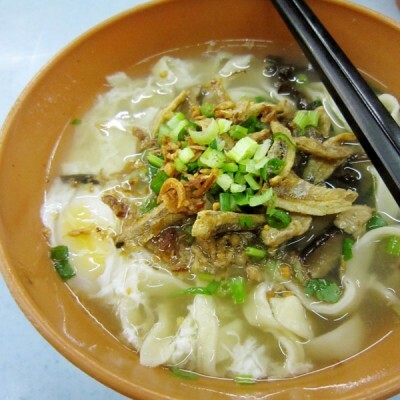 Ark thooi mee suah (RM3.80) consisted of a whole duck leg and fine noodles in double boiled herbal soup. 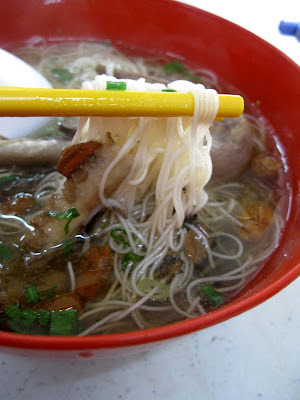 The mee suah was firm and smooth, unlike the floury ones available commercially. I liked the strong herbal flavour of the soup, and the duck meat was falling off the bone. 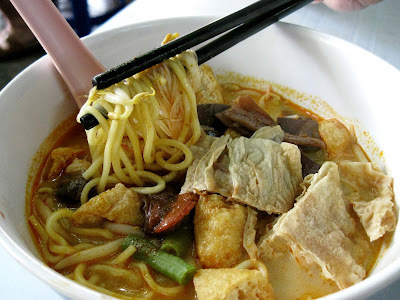 The curry mee was decent, but I still preferred the one from Chulia Street. By this time, I got over my phobia of coagulated blood and managed to eat two cubes of it. 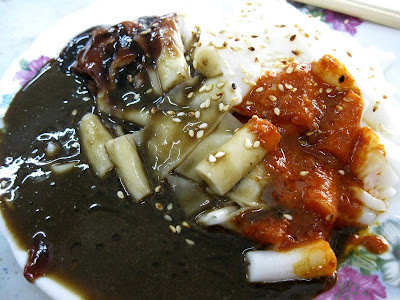 Topped with sesame seeds, the chee cheong fun (RM2.40) had a smooth, soft and slightly chewy texture. The accompanying prawn paste was thick and slightly sweet, which complemented the lovely rice sheets. Kedai Kopi New Cathay is a corner coffeeshop located along Jalan Burmah. The place was packed with people when I reached there at 9am, and I had to wait for a seat. The curry mee (RM4) had cuttlefish, prawns, tau fu pok, coagulated pig’s blood, beansprout, cockles and mint leaves. While it was pretty decent, I would prefer the broth to be thicker and spicier. Luckily, the sambal chilli added some “kick” to the noodles. 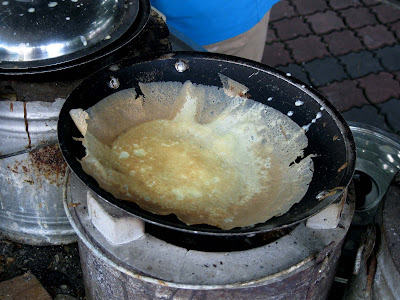 I didn’t enjoy the fried carrot cake (RM3.50) – some parts were slightly charred, causing them to taste bitter. 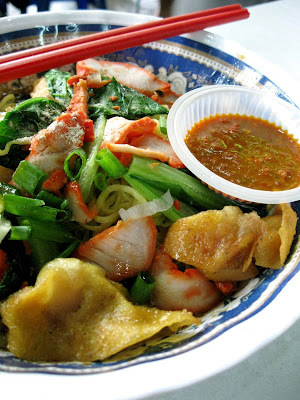 The Char hor fun (RM3.50) was average but I was pleasantly surprised with the wantan mee (RM3.80) – it was quite delicious. 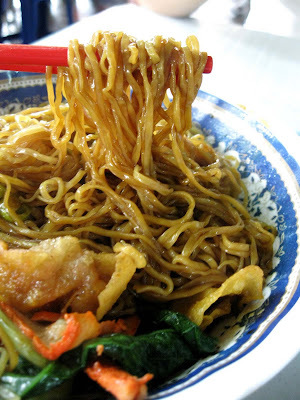 The noodles were firm yet springy, and I liked the crispy fried wantan it came with. 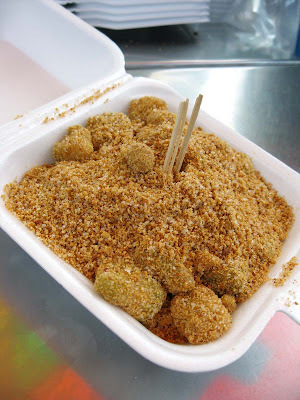 We bought some sweet apom (RM3 for 6) from the vendor next to the coffeeshop. The delicate pancakes were cooked over a charcoal fire. Each pancake had crispy edges while being moist and fluffy at the centre. Very nice! Kedai Kopi New Cathay Jalan Burmah. 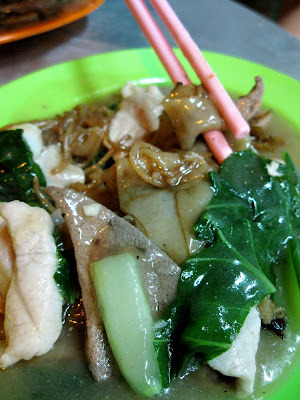 This is one of the most popular char kway teows in Penang, and one would have to wait for 30-40 minutes for a plate. 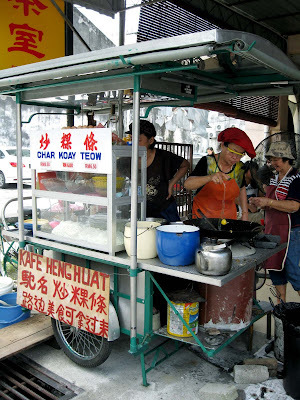 It is not easy to miss the lady who fries the char kway teow – she wears a huge goggle with a red hat. 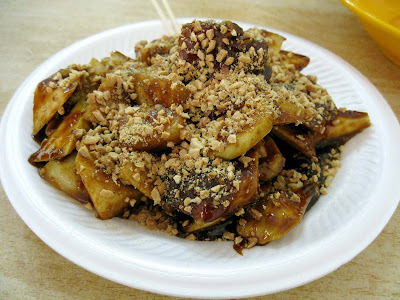 While waiting for my CKT, I ordered a plate of rojak (RM4), which tasted rather average. 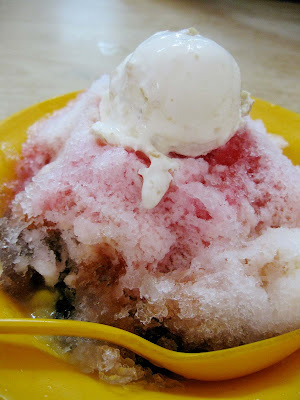 We also had a bowl of ais kacang (RM3.50) each, to cool down from the hot weather. This ais kacang was creamier than Swatow Lane’s version. While I liked its richness, I still preferred the latter because it uses peanut ice cream. The char kway teow was as tasty as I remembered it to be, with huge prawns that were fresh and succulent. Cooked with coal fire, my premium plate (RM8.50) came with slightly crisped Lap Cheong (Chinese sausage), juicy cockles, egg, beansprouts and chives. 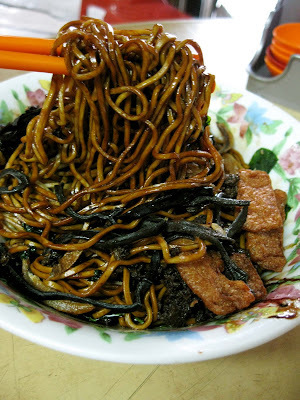 To add oomph to the noodles, the auntie added bits of crushed lard into the mixture, together with the bigger pieces of lard. A little oily, this one, but the taste hits the spot and it lingers on in the mouth. 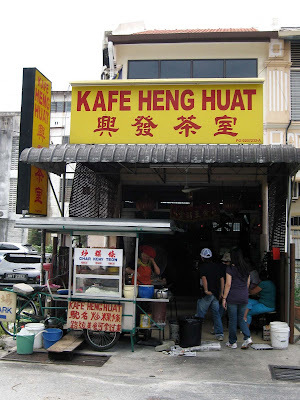 Kafe Heng Huat 108 Lorong Selamat Penang. Like most of my eating trips, I didn’t dare step on the weighing scale for days. But I was glad I managed to try most of the food I wanted this time around. Don’t ask me how much weight I gained on this trip – that’s for me to know and for you to find out! *There are many more places I went to in Penang, and it will come out in my next Penang post. There’s just too much to fit into this column. So look out for it next month! 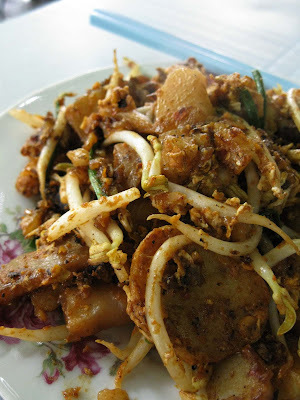 wow, i cant digest that much of good food….unless i have a cow's stomach…LOL…glorious Penang food! gosh gosh… I have indigestion prob lately.. haha.. I stopped half way while reading your post. I can't go on any longer. Wait till it has been restored till normal only I continue k.. LoL. So many food! just can't believe you can stomached so much! u r like one of my colleague..eat so much yet still so thin..thats alot to eat. still prefer mua chi in gurney hawker center..and my fav mamak..line clear..:D should go during after 1am for their fresh fried chicken..
gosh..if only i could eat like that, and my body will not change. lol.. looks delish.. congrats on the article in metro! Brian – Yes….yum is the best word to describe everything! foodbin – Not just me alone…that was for 4 days! leo – Cannot say that…I work hard to stay slim too! 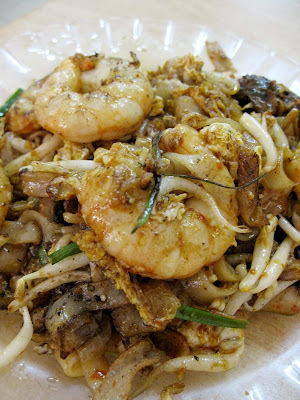 Actually there are more better char koay teow compare to the sisters one. recently they are kind of sombong to the customers, expensive hence salty abit. 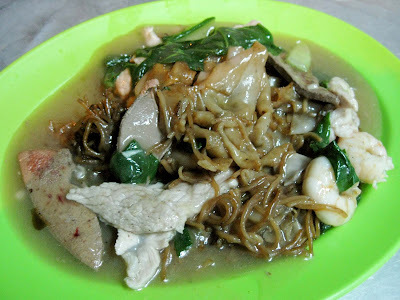 I din have their koay teow before even though i'm from penang, i prefer other place one..will share to you..and i love food too!